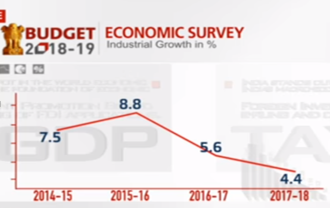 What economy survey says- The economic survey collates the latest information on every sector and represents the same in a comprehensive form. There are some projections related to the GDP while there are various suggestions made on various aspects of economy. The main purpose is to define the risk so that no exaggeration is brought frequently regarding the current issues. The analysis helps to define the risks more carefully. The speculation, uncertainty and rumour mongering has to be calmed down. The Economy Survey, 2017 signals that there are pressures such as rising oil prices, indirect tax collections, non-tax revenue, non-debt capital receipts etc. 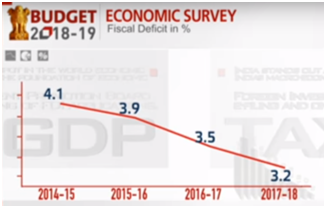 While the survey suggestion is not binding, it may a give a clue that fiscal deficit target for FY 19 will not be 3% but higher. Given the uncertainty due to demonetization and GST have produced, one of the purposes of the survey was to analyse and make things clear to public and analysts. 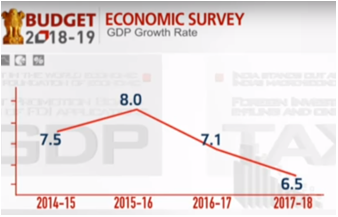 It says that the worst is over and India is on a recovery path. The next year, GDP is expected to be 7-7.5%. Unless the GST gets stabilized, the indirect tax collection cannot go up. Though preliminary analysis of the GST data reveals 50% increase in the number of indirect taxpayers. Banking reforms are needed to address the twin balance sheet problem. Disinvestment of Air India completely. Emphasis on institutional structure of GST council. It talks about exports and investment led growth. In the Indian context, the household savings and the public savings have good opportunity to increase the investment led growth. There is an apparent shift from investments in housing, land and gold to financial markets. This inflow from domestic sector has been phenomenal. More representation of women needed in decision making process in the country as their political participation has been low despite them accounting for 49% of the population. Extreme weather adversely impacts agriculture yields. The agricultural credit will be touching 11 lakh crores this year but the number of beneficiaries is stagnant at 4-5 crore farmers. So how to expand this base is critical. Indian parents continue to have children until they get desired number of sons. States’ prosperity is positively correlated with their international and inter-state trade. Education, Agriculture and Employment and jobs- These are three focus areas by the government in the medium term. The oil prices will not give cushion to the Indian economy any more with low or moderate oil prices. Hence there is a need for policy vigilance. There may not be same 1 lakh crore revenue like last year from disinvestment in year 2018-19. 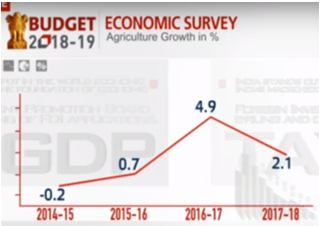 Fall in agricultural growth had direct impact on GDP. Indian banks have to resolve their twin balance sheet problem with 4 ‘R’s – Recognition, Resolution, Recapitalisation and Reforms. The policy agenda for next year will be to support agriculture, privatise Air India and finish bank recapitalization. The government need not take any radical step now and instead focus on finishing the reforms undertaken by reaching its goal. Investment climate is slowly changing. Till now India was banning too much on public spending so now it is expected that the private investment will pick up. Where the money is spent is important and what kind of output was received out of the spending will determine the areas of importance and need to invest more in those areas. Though the GDP estimates is at 6.75% in current year, the expected growth between 7-7.5% will be a major boost for Indian economy. 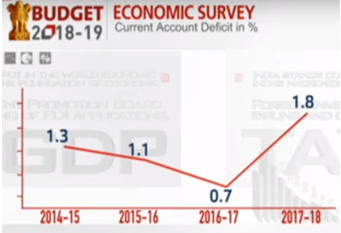 The economic survey highlights current fiscal’s health and gives way for future course of action. Do you agree? Explain with reference to 2017 survey.